Seven days before the Feast of the Annunciation (25 March) which commemorates Gabriel’s visit to Mary announcing that she is to give birth to the Messiah, we meet St Joseph, her spouse. St Joseph was born in Bethlehem and worked as a carpenter (Matthew 13:55: “Is not this the carpenter’s son?”), an occupation he later passed on to his Son (Mark 6:3: “Is not this the carpenter, the son of Mary, the brother of James, and Joseph, and Jude, and Simon? are not also his sisters here with us?”). He became betrothed to Mary, a consecrated Virgin, in order to serve as her protector. Apocryphal writings indicate that Joseph was an older man at the time, and was a widower with grown-up children, but there is no way to know for certain. But while he thought on these things, behold the angel of the Lord appeared to him in his sleep, saying: Joseph, son of David, fear not to take unto thee Mary thy wife, for that which is conceived in her, is of the Holy Ghost. And she shall bring forth a son: and thou shalt call his name JESUS. For he shall save his people from their sins. Now all this was done that it might be fulfilled which the Lord spoke by the prophet, saying: Behold a virgin shall be with child, and bring forth a son, and they shall call his name Emmanuel, which being interpreted is, God with us. And Joseph rising up from sleep, did as the angel of the Lord had commanded him, and took unto him his wife. After Jesus was born, an angel again appeared to St Joseph and told him to take the Holy Family away in order to escape the wrath of Herod. But when Herod was dead, behold an angel of the Lord appeared in sleep to Joseph in Egypt, Saying: Arise, and take the child and his mother, and go into the land of Israel. For they are dead that sought the life of the child. Who arose, and took the child and his mother, and came into the land of Israel. But hearing that Archelaus reigned in Judea in the room of Herod his father, he was afraid to go thither: and being warned in sleep retired into the quarters of Galilee. And coming he dwelt in a city called Nazareth: that it might be fulfilled which was said by prophets: That he shall be called a Nazarene. And when he was twelve years old, they going up into Jerusalem, according to the custom of the feast, And having fulfilled the days, when they returned, the child Jesus remained in Jerusalem; and his parents knew it not. And thinking that he was in the company, they came a day’s journey, and sought him among their kinsfolks and acquaintance. And not finding him, they returned into Jerusalem, seeking him. And it came to pass, that, after three days, they found him in the temple, sitting in the midst of the doctors, hearing them, and asking them questions. And all that heard him were astonished at his wisdom and his answers. And seeing him, they wondered. And his mother said to him: Son, why hast thou done so to us? behold thy father and I have sought thee sorrowing. And he said to them: How is it that you sought me? did you not know, that I must be about my father’s business? And they understood not the word that he spoke unto them. And he went down with them, and came to Nazareth, and was subject to them. And his mother kept all these words in her heart. And Jesus advanced in wisdom, and age, and grace with God and men. Tradition tells us that he had the great honor to have died in the presence of Our Lady and his Son, which fact makes him the patron of a holy death. Because during his life he was given the great responsibility of caring for and protecting the Virgin — who is the Mother of all Israel — and her Son, St. Joseph is considered the patron and protector of the entire Church. This is the general rule that applies to all individual graces given to a rational creature. Whenever divine grace selects someone to receive a particular grace, or some especially favoured position, all the gifts for his state are given to that person, and enrich him abundantly. Glorious St Joseph is a much-needed model for men these days in the West where masculinity and the male father-figure is under such diabolical attack. The strong, courageous, manly, protective, responsible, decision-making Joseph… who was at the same time loving and caring of his Holy Family, stands as a firm witness to True Manhood. 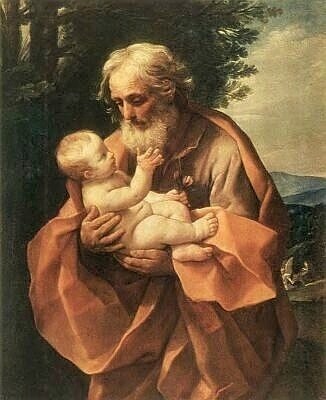 I have heard this theory that St Joseph was an older widower has since been discarded by Catholic theologians as untrue! It might have been invented by those who could not imagine a younger married man could live in perfect celibacy and chastity while living with his Spouse. The supernatural grace bestowed upon St Joseph, with the knowledge of Her Virginity and Divine Maternity, was far superior to anything they could have imagined.